Extrusion printing is an effective way to make rough approximations of parts. It is a simple process with a clean and manageable form of raw material. However it is not a good process for creating finished, high-quality parts quickly. As you decrease nozzle diameter and reduce layer height to allow for smaller feature sizes and smoother surfaces, build times become ridiculous. With the H-Series tool changer, you can switch between large nozzles for bulk fill and small nozzles for detail, but this only allows for marginal increases in print speed. Surface finishes are greatly improved, especially on low angle contours. There is a world of difference between the finish of normal FDM parts and milled surfaces. It reduces the need to dial-in print settings for a given material and part geometry. By excessively over-extruding material, the process is less sensitive to variations in filament properties. For many geometries, it is possible to do all of the subtractive steps at the end of the build. Take this headlamp prototype for example. The general shape of the part allows it to be cleaned up with 2 milling setups. However, the Z-height of the part is larger than the reach of the cutting tool, so the milling operations were done sequentially with the printing operations. These parts were made with PETG which does not adhere well to the polyimide print surface. 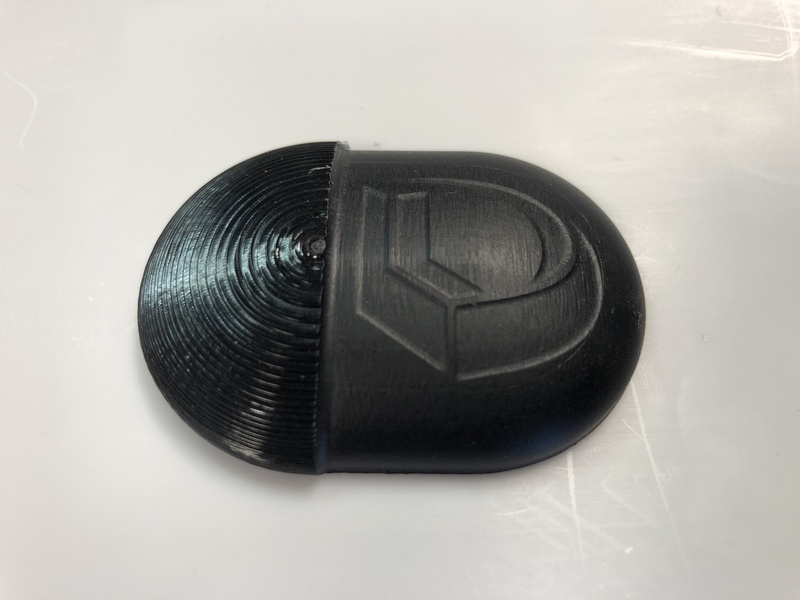 So a urethane adhesion layer was first printed, then the part was built in 20mm sections, each printing step followed by a cleanup operation with a ball end mill. In order to clean up the bottom, a fixture to clamp the parts horizontally was first printed and milled (shown in the 4th image above). This is a good alternative to using a vise for secondary operations, as it allows a part with curved and angled surfaces to be clamped rigidly and accurately in a known location. But why not just mill the parts from solid stock? That is certainly an option. The H-Series is a very capable milling machine. For many jobs, traditional milling will be a faster and more accurate way to make parts with known material properties. Waste! The primary reason to use near-net printing is that less high-value raw material is turned into low-value chips. With traditional machining, often 50%-90% of the stock is cut away. With near-net processes, this waste can be reduced to 2%-10%. Fixturing and locating stock is simplified. If the stock is first printed, its coordinates within the build volume are known. Fixtures for secondary operations can be printed and milled (as shown above). For parts with smooth curves and organic shapes, this can eliminate major workholding headaches.